The 2013 season is in full swing for the Chesapeake Bayhawks, who are the defending MLL champs, and for the Hawkettes as well. The new energy that coach Angel has brought shows in every on-field routine. Last year the Hawkettes were, in my admittedly biased opinion, one of the best dance teams in the league. Angel’s background with the Baltimore Ravens has brought an even greater energy and sense of professionalism. Tiffani works for the Justice Dept., Kristin recently graduated with a Major in Finance, and Emily is studying graphic design. Kelly is studying computer information systems and graphic design, Halsey just received her degree in Communications, and Erin is a human resources consultant. Danielle is a Veterinary Assistant, Jordan is a occupational therapy major, and Jade is a Captain with a degree in Sociology. Katelyn is a Captain and an account supervisor for idfive, and Renae is a pharmacy technician. Emily is a nursing major and Brooke is majoring in occupational therapy. Back row: Captain Jade, Emily R, Brooke, Kristin, Kelly, Arynn, Tiffani, Emily L. Front row: Danielle, Erin, Renae, Jordan, Captain Katelyn, Halsey. More big changes are in the air for the Chesapeake Hawkettes. In addition to adding 11 new ladies to the squad, the Hawkettes are introducing a new coach as well. Angel P has taken over the reins. Coach Angel, far right, works on the tryout routine with prospective dancers. Angel brings a professional pedigree, having just retired from the Baltimore Ravens after six seasons-three as captain and in her last year as the only Pro-Bowl/Super bowl cheerleader. She works as a residency coordinator at the Johns Hopkins Hospital radiology department, and was was recently honored by the Bel Air Maryland Board of Town Commissioners Tuesday for her work with the community and with U.S. troops stationed overseas. She traveled to Bahrain and Djibouti in 2010 with the USO to entertain American troops, and works with the Ronald McDonald House, the Boys and Girls Clubs of Harford County Maryland and promotes breast cancer awareness. Prospective Hawkettes not only had to learn a dance routine, they also sat for a business-style interview. Hawkette veteran Katelyn meets with Angel. The Hawkettes are currently preparing for their home opener on May 4th. I finally had my chance to right a wrong that I had committed against the Denver Outlaws Cheerleaders way back in 2010. I was shooting the Major League Lacrosse playoffs in Annapolis, and back then I was still shooting film. The temperature at Army-Navy Stadium reached about 105 degrees on the field and even though I was careful to keep my camera bag in the shade, my film was absolutely cooked. Every shot had to be Photoshopped within an inch of it’s life to be simply acceptable. Fortunately the ladies of the Outlaws and their director Brianna were gracious and forgiving. In the first playoff game, the Outlaws overcame a 9-point deficit to come from behind and win over the Long Island Lizards. However, they were beaten by the Chesapeake Bayhawks in Sunday’s final. As it turned out, all the Outlaws cheerleaders who were able to come to Boston are 2nd year Captains. Angela is a student at Colorado State, and Kelsey is a sales associate. Nikki is an advertising Major at the University of Colorado Boulder, Hayley is a hairstylist, and Megan is a Psych major at the University of Colorado. Nikki and Hayley also cheer for the Colorado Mammoth, as well at the Outlaws. Celebrating a goal during the final game. The Boston Cannons Cheerleaders during MLL playoff weekend. Upon arriving back in Boston after a ten year absence, I found myself standing on the hallowed grounds of “Haavaad” Stadium. Midwest correspondent Dave is right- my IQ jumped a few points merely by walking through the gate. On the first day of playoffs, the Boston Cannons were set to play the Chesapeake Bayhawks. The Cannons held the lead at the half, but the Bayhawks came from behind to finish with a strong 16-10 victory. Unfortunately, Deanna was sidelined by a back injury. Ines and one of the best hair flip shots I've ever taken. There’s no way I can top Dave’s great coverage of this fine squad, so I’ll just present my game photos. 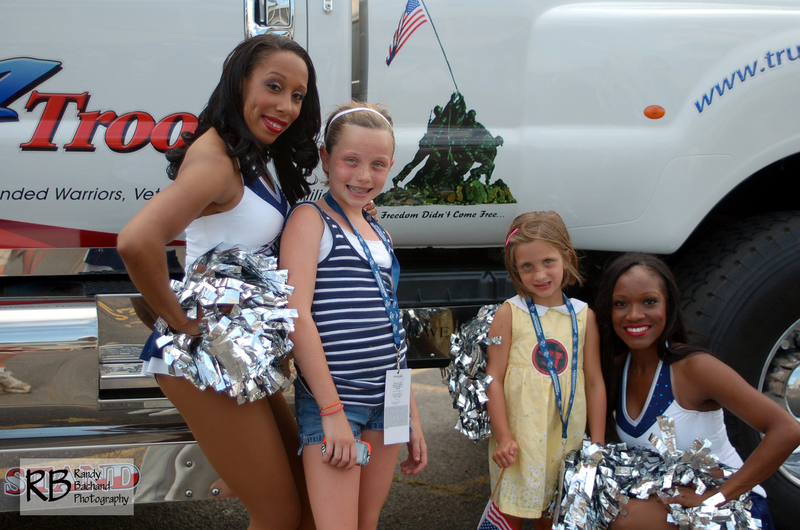 Continue reading The Boston Cannons Cheerleaders during MLL playoff weekend. 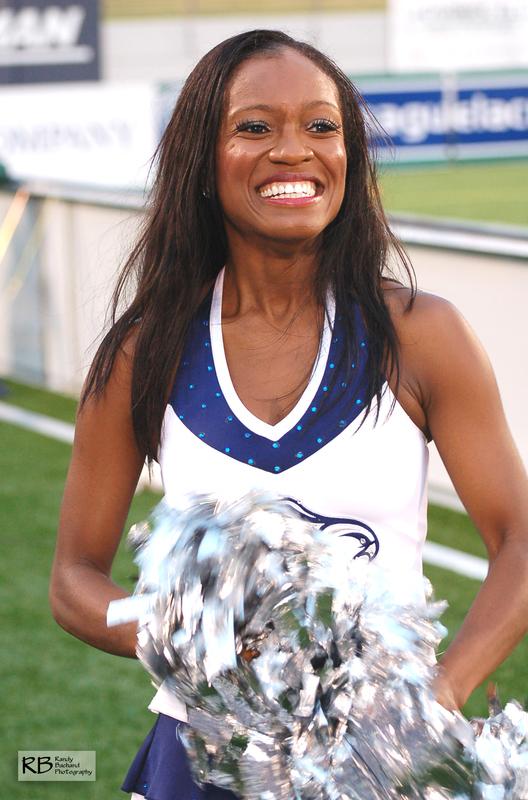 The Chesapeake Bayhawks played their last home game before proceeding to the playoffs at Harvard Stadium in Boston. With a berth clinched, and a game delayed by a thunderstorm, I took the time to do some long delayed small group shots. Kelly is a Marketing Associate, Eve is a nursing student pursuing her 2nd Master's degree, and Asst. Captain Kim teaches 2nd grade. Shiresse is a Mental Health Therapist, Katelyn works as a Marketing Coordinator, and Emily is a Student and Dance Instructor. Asst Coach and Captain Kelly is a Fitness Manager, Amanda teaches Gymnastics, and Kristen is a student and Bartender. The Hawkettes with Coach Joanna, a former member of the Washington Wizards Dance Team and Washington Capitals Red Rockers. The Chesapeake Bayhawks have had a great year with an 8 and 2 record that clinches a playoff berth. The Hawkettes year has been no less spectacular. Back row: Danielle, Jade, Emily, Kelly, Stephanie, Amanda, Eve. Front row: Shiresse, Katelyn, Asst. Coach/ Captain Ashley, Asst. Captain Kim, Kristen, Taylor. The Big Vanilla Athletic Club was once again the site of the tryouts for the Hawkettes, the dance team of the Chesapeake Bayhawks. This year brings big changes to the squad. Assistant Coach Becca has joined the Washington Redskins Cheerleaders, and Captain/Coach Joanna has taken on the role of Coach. Ashley and Joanna teach the routine. Joanna and the judges watch a video for a potential dancer. 3 year veteran Kim is now Assistant Captain. Judges watch a video for a potevtial dancer. 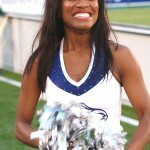 The Chesapeake Hawkettes cheered on the Bayhawks to the Major League Lacrosse playoffs this weekend, but the playoffs are threatened by the arrival of Hurricane Irene. Also threatened is a dance clinic featuring the Hawkettes and the visiting Denver Outlaws Dance team. The Chesapeake Bayhawks picked up a big win against the Rochester Rattlers at their last home game. The Chesapeake Hawkettes showed off their own winning style in front of over 8400 fans. The pregame parking lot is always a place to hear local bands, and sample food. It’s also a place for fans to have an opportunity to meet the Hawkettes. In my last post, I introduced the rookies. Here are this season’s returning veterans. Joanna teaches kindergarten, coaches dance and is in her 2nd year as the Hawkete’s Captain, Coach and Choreographer. She has also danced with the Washington Capital’s Red Rockers. Becca is a Nutrition Consultant and the Hawkette's Assistant Coach. Another former Red Rocker, Kim is a student teacher. Stephanie is studying Medical Administration. Heather is a Graphic Designer for the Believe In Tomorrow Children’s Foundation. Tina has a degree in Sociology and works in human resources. There are more opportunities to meet the Hawkettes after the game. Here Katelyn signs the shirt of a young fan.  Click here to go the Hawkette’s website. 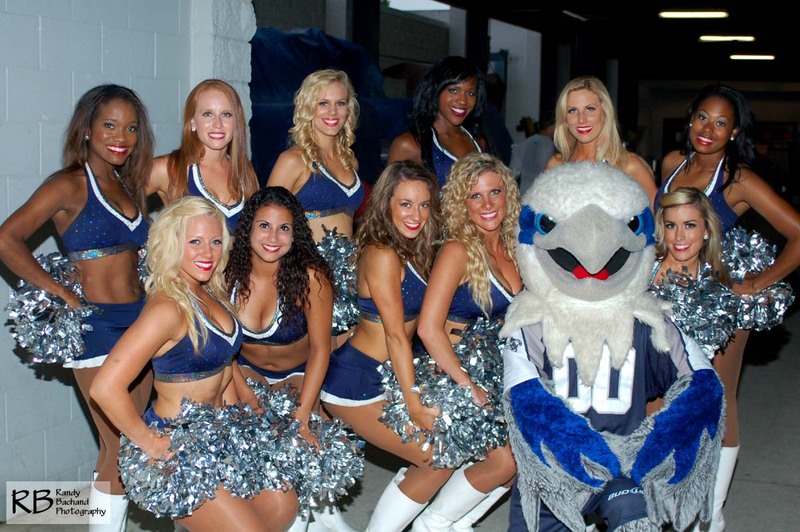 The 2011 MLL season has begun for the Hawkettes, the official dance team of the Chesapeake Bayhawks. It was a pleasantly warm evening at the Navy-Marine Corps Memorial Stadium, and 8000 plus fans were present for the recent game versus the Boston Cannons. Katelyn is a Graphic Designer, student and dancer. Shiresse is a Psychotherapist with a private practice. Sydney is a theater major and actress. 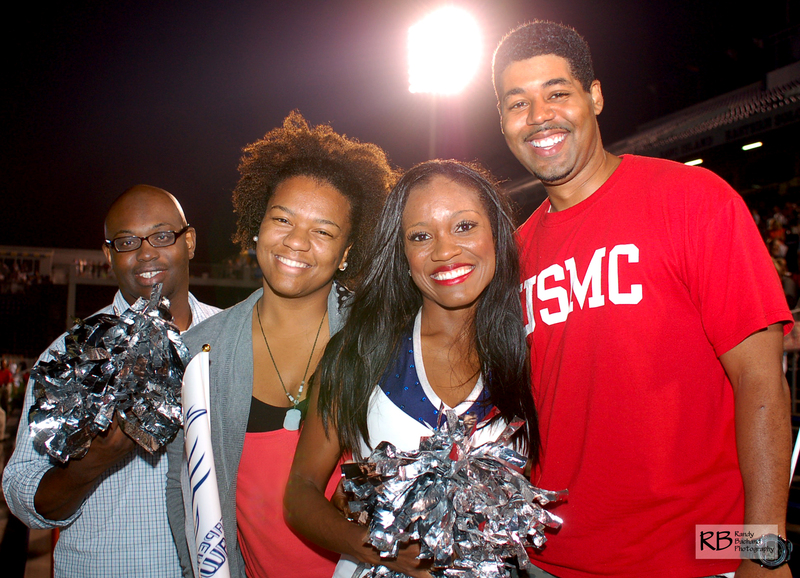 Danielle is Assistant Academic Coordinator for Athletics at Morgan State University. She coaches cheerleading and has a 5 year old son. 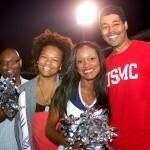 A former dancer for the Washington Wizards, Sarah also directed the Washington Capitals Red Rockers Dancers. Front: Shiresse, Becca, Joanna, Valerie, Britt, Sydney. Rear: Kim, Danielle, Sarah, Stephanie, Heather, Katelyn. Tryouts for the 2011 Chesapeake Hawkettes were recently held at the Big Vanilla Athletic Club in Arnold, Maryland. The Hawkettes are the dance team for the Chesapeake Bayhawks of Major League Lacrosse. Under the direction of Coach Joanna and Assistant Coach Becca, twelve young women will comprise this year’s squad. Joanna and Becca put the hopefuls through their paces.